A man spends his days fly fishing in the Salmon River near the town of Main Brook in Newfoundland, Canada. 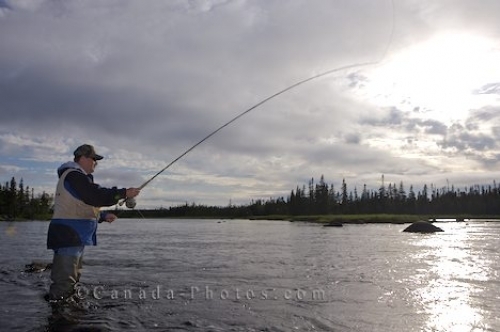 As the clouds roll in over the Salmon River near Main Brook, Newfoundland, a man is determined to continue fly fishing in hopes of a catching a large salmon. Many fishermen come to the Salmon River to fly fish but you never feel crowded as the shores of the river extend for quite a distance amongst the Newfoundland wilderness. Picture of a man fly fishing in the Salmon River in Newfoundland, Canada as the clouds block out the sun.